Use mechanism of digoxin to explain effect on contractility. Effect of hypokalemia on digoxin effects? Why? What histologic changes would you see visually in transient ischemia? Why? What is the clinical presentation of someone with hypercalcemia? Why does this make sense? What is the clinical presentation of someone with hypocalcemia? Why does this make sense? Since the USMLE Step 1 is a test of your ability to apply and connect your knowledge, being able to connect such disparate things as reversible cell damage and digoxin effects will be critical to reaching your peak potential. This is the exact strategy I used to score 270 on the USMLE Step 1. NOTE: Many of these concepts I discuss here build on a previous lesson, which you may want to reference. What sets the normal Na/K gradient across the cell membrane? So what does the Na/K ATPase (pump) actually do? Normally, Na+ would NOT want to move outside the cell, because the outside is POSITIVE relative to the inside, and the Na+ concentration is much higher outside. Thus, we need the energy derived from ATP hydrolysis to drive these ions against their respective gradients. How many ions of each does it move, and in what direction? But doesn’t Na+ normally want to move INSIDE the cell? Yes, when Na+ channels open, Na+ will move INSIDE the cell, because of the concentration gradient (more Na+ outside the cell), and electrical gradient (inside of cell negative relative to outside). This is what makes the Na/K ATPase special – it moves Na+ and K+ against their respective concentration gradients, which requires the use of ATP. 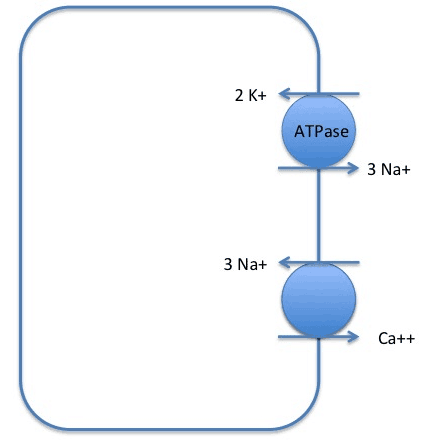 What would the membrane potential be if I were to block the Na+/K+ ATPase (more or less negative)? What effects would hyperkalemia have on membrane potential? Similar effects to blocking Na+/K+ ATPase activity. In hyperkalemia, there is more K+ extracellularly. Thus, there will be a weaker concentration gradient for K+ across the membrane (recall that the majority of K+ is intracellular). Clinically, what ion can you give to someone with hyperkalemia? How is this thought to help? Clinically, often you give Ca++ to patients with hyperkalemia. In hyperkalemia, recall that the resting membrane potential is more depolarized, meaning that it is CLOSER to the action potential threshold (You can imagine that it would NOT be beneficial for your heart cells to fire more easily, as this leads to arrhythmia). Ca++ is thought to (and is shown experimentally*) to raise the threshold for depolarization, albeit transiently. Thus, when hyperkalemia ↑ membrane potential, moving it closer to the action potential threshold, you give Ca++ to ↑ the action potential threshold. What is the mechanism by which Ca++ is pumped out of the cell? What drives this process? Here, again, Ca++ is moving AGAINST its chemical gradient (recall: there is more Ca++ outside the cell than inside). Thus, the energy provided by Na+ moving DOWN its concentration gradient allows for the transport of Ca++ out. This is analogous to how the energy from ATP was used to pump Na+ and K+ against their respective concentration gradients. Digoxin – blocks what protein? At which site? Binds to the site for K+ binding (i.e. K+ and digoxin compete for the same binding site). Ready to apply your USMLE Step 1 knowledge like a boss? We can make sense of this by thinking that Ca++ is increasing the depolarization threshold generally, throughout their body. Thus, they will feel slow (fatigability, lethargy), and be weak (areflexia/weakness) that may even lead to coma. Neuromuscular hyperexcitability (i.e. it takes LESS to get depolarization, since Ca++ ↓ → DECREASED threshold for action potential). This is opposite the effects you want when you give someone that is hyperkalemic (and thus who has more depolarized membranes) calcium. Recall that in someone that is hyperkalemic, their membrane potential is more positive, and thus is closer to action potential threshold. We give them calcium (and make them hypercalcemic) in these situations because calcium will RAISE the threshold for action potential firing. Conversely, in the case of being HYPOcalcemic, we will LOWER the threshold for action potential. Blood pressure cuff inflation → transient ischemia → ATP ↓ → Na+/K+ ATPase activity ↓ → membrane depolarization → CLOSER to threshold of depolarization. Since in hypocalcemia, cells are already closer to depolarization, depolarizing the membrane w/ transient ischemia presumably → action potential → muscle contraction. **Out of curiosity, I looked up to see what literature there was on serum Ca++ levels and membrane excitability. If you’re interested in learning more, there’s a paper on the topic…from 1968(!!!). Awesome!